Tru Blood doesn't get to have all the fun. Jones sodas have put out some new flavors in honor of our favorite slayer. I wouldn't mind trying it but for $12.99 for a 6 pack someone else will need to be buying. Yep, a bit spendy. I like Jones sodas, overall, so I bet if you can find these, they would taste awesome. Probably more of a collector's item, though. I actually thought they were much more affordable than Tru Blood ( like $5 a bottle at Borders). I might give them a try if I can find them. Thanks for the heads up Michele. 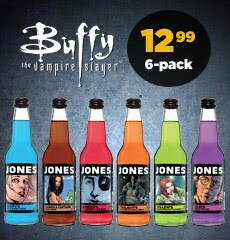 I'll keep a lookout for some Buffy soda. What will they think of next...? If anyone sees them in their grocery store, let us know!